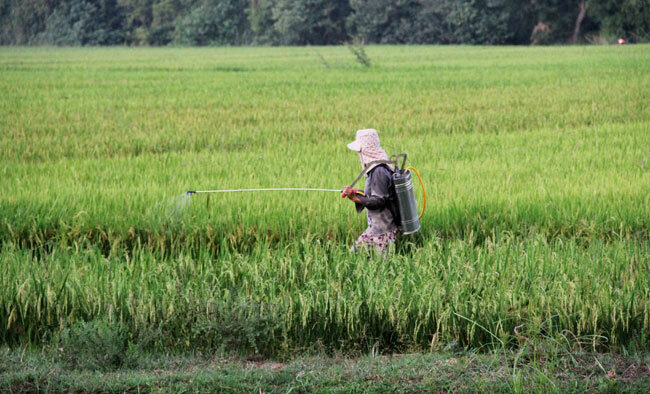 THUA THIEN - HUE (VNS) — The increasing overuse of chemical pesticides and fertilisers are posing more threats to farmers' health and agroproduct consumers, but authorities have never had an eye on the overwhelming consumption of the chemicals in agriculture. This would also exert more pollution pressure to the environment at a time when critically polluted areas by pesticide waste from the subsidy period has not been dealt with properly yet. Participants to an open forum held in Thua Thien - Hue Province last Friday agreed that the use of chemical pesticides is on the rise. They were NGOs, officials of departments of natural resources and environment, plant protection agencies, and farmers from central localities of Quang Nam, Da Nang, Thua Thien - Hue, Quang Tri and Quang Binh. According to Assoc. Prof. Nguyen Vinh Truong of Hue University of Agriculture and Forestry, the importation of pesticides, grass killing sprays, and plant disease killers increased 138 per cent, 196 per cent and 138 per cent respectively in the period of 2009 to 2013. "Remarkably, the country's total importation of chemicals used for plant protection in 2013 was 5,000 times over that in 1994," Truong said, adding that this proves the overuse of chemical pesticides and makes the health risk, food poison and pollution more severe than in previous times. Farmers at the forum admitted that the use of pesticides is due to the strong belief that they produce higher yielding crops while plant protection officials said the overuse of pesticide is explainable by the desire of increasing productivity. "Farmers in my community rely on pesticides and the pesticides help them to be feel safe with their crops. Some of them knew about the toxic influence but it wasn't a really big deal," said Nguyen Qua, head of a community growing 40ha of spring onions in Huong An Commune in Thua Thien - Hue. Tran Van Tan, head of Thua Thien - Hue department of plant protection added that without pesticides, no one could assure a bumper crop. "The use of pesticide, or even overuse, is crucial to increase higher productivity on the same area, which means a lot to the income of farmers," he said. Le Nam from Da Nang department of plant protection admitted that his agency failed to control the compliance of permitted use of pesticides for farming. He said Da Nang City has four retail stores and five manufacturing facilities of pesticides and all of them pollute the surrounding areas but the agency does not have the authority to fine. A report by Hue based Centre for Social Research and Development (CSRD) showed that 88 per cent of farmers interviewed said they relied on pesticides for fast and strong results of treatment. Liliane Danso Dahmen, director of the German foundation Rosa Luxembourg Stiftung's Southeast Asia office expressed concern that the health impact from toxic pesticides, including some that have been prohibited from use in the world, that farmers and agroproduct consumers could be harmed. She expected activities to raise awareness among farmers on the negative influences from the chemicals could be organised better. Following a story carried by Viet Nam News in March telling about the hardship that locals in Quang Tri endure from critical pesticide pollution caused by chemical waste in storage from the period of 1979-1993, Rosa Luxembourg Stiftung initiated an education campaign. In May, the foundation organised an investigation trip, in collaboration with Viet Nam News, to the impacted sites in Quang Tri and funded CSRD for investigation of the pollution in some districts in Thua Thien - Hue. At the forum, which the foundation funded and co-organised with CSRD and Thua Thien - Hue Department of Natural Resources and Environment, Rosa Luxembourg Stiftung expected participants to brainstorm and convey the toxic dangers from pesticides to farmers in the localities. The forum organisers hailed the use of traditional green pesticides and fertilisers instead of chemicals and the utilising of natural pest enemies to treat pests in farming. Participants also wanted consumers to be smarter by purchasing agroproducts from farms that use green cultivation techniques. The organisers recommended stronger actions from related agencies in reducing the overuse of chemical pesticides and urgent treatment to rescue locals in Quang Tri from pesticide pollution, with some areas having content of DDT at 2,168,024 times over the allowed level. Some positive signs have been seen at the forum, as Hoang Thi Thuan, a farmer from Huong Tra District in Thua Thien - Hue Province determined that she would do hoeing to kill grass rather than relying on grass-killing sprays.